Small and lightweight just got more powerful with the introduction of Phil Jones Bass’s BP-800 bass amplifier. The BP-800 is a high power, high performance no compromise compact amplifier that delivers more bass for the buck at a street price of $799. 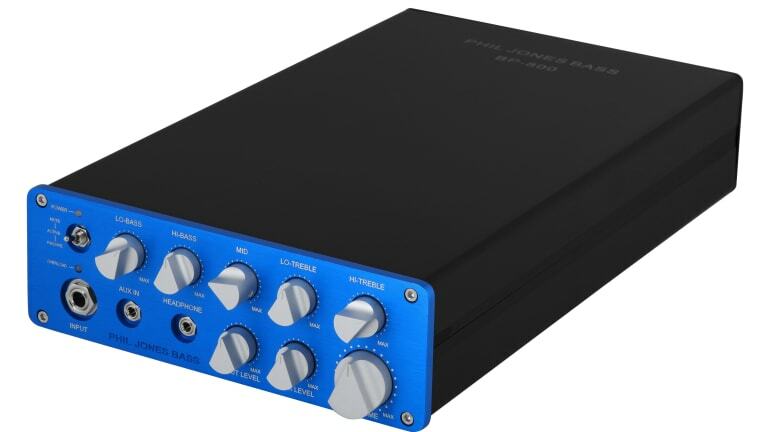 The BP800 features a Class A pre-amp with the popular PJB 5-Band EQ. Although it weighs only 5.7 lbs and is 7.5” wide the BP-800 is built with the ruggedness and precision needed to withstand all the rigors of live performance and the road. The appealing blue front panel is a quarter inch thick and CNC machined while the chassis is built from thick aluminum extrusion making it incredibly strong. All control knobs are PJB design solid aluminum billet for a high end look and feel. The BP-800 will work on any AC voltage from 100- 240 volts AC enabling it to conveniently travel worldwide without having to switch to local AC supply voltages. The Power Output is 450 watts into 8 Ohms, and 800 watts into 4 ohms (maximum load). The dimensions are 7.5” wide x 2.5” high x 12.5 “deep.